Follow the steps below to "upvote" an existing feature request or to submit a new one. Step 1: Login to the community system. You must be logged in to this system to submit a new feature request or "upvote" existing requests. Login to Canvas and click the "Help" link. 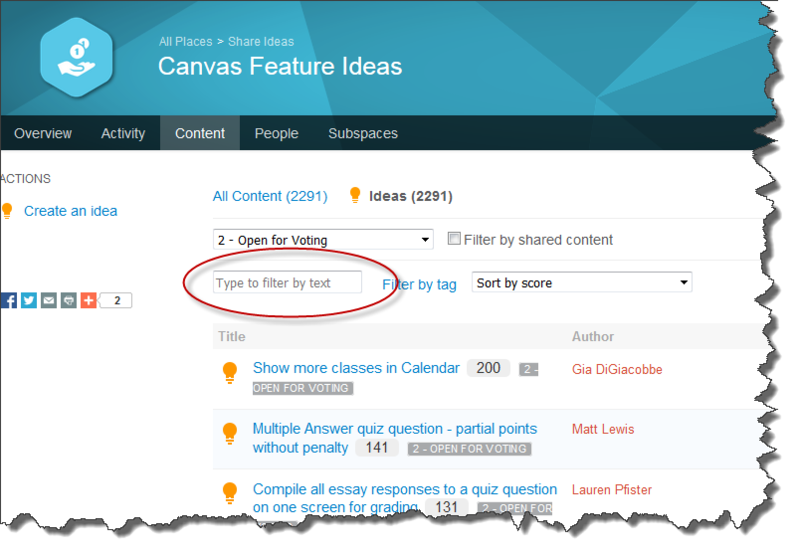 Select the "Submit a Feature Idea" link in the popup window--this will send you to the "Canvas Feature Ideas" page at https://community.canvaslms.com/community/ideas/feature-ideas. Find the "Log in" link and log in to the community system. If you have previously logged in to Canvas as instructed above, then you will automatically be logged in to the community system when you click the "Log in" link. NOTE: You may be asked to confirm your profile details before fully authenticating into the system. Step 2: Find/upvote existing feature requests. 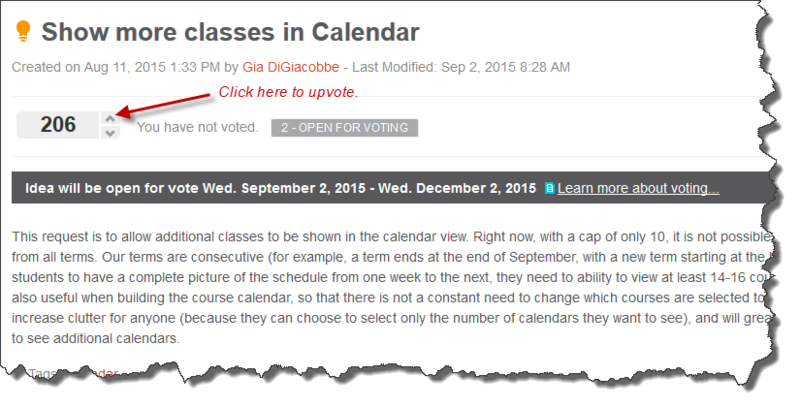 When using the Canvas Feature Ideas system, we recommend that you begin your search by viewing those requests in the "Open for Voting" category. Ideas in this stage of development still need votes to be further considered by Instructure's developers. Once an idea reaches the "Gathering Info" stage, it isn't as critical to upvote the feature, but users may continue to upvote/comment on any feature in the "Gathering Info" stage. Step 3 (Optional): Create a new feature request. If you have searched Instructure's feature request forum and have not found an existing document for your request, submit a new request. Follow these instructions to submit your feature request. Keep in mind that there are plenty of tools in Instructure's community portal that allow you to track the progress of feature requests. If you need additional assistance, please contact Instructure directly at (844)334-0228.